It was at the height of Atsuhara persecutions that Nichiren Daishonin inscribed the Dai-Gohonzon for all humanity on 12 Oct 1279, fulfilling the purpose of his appearance in this world. The inscription occurred three days preceding the Atsuhara persecution in which the three Atsuhara farmers known as the three martyrs were executed for their unwavering commitment to their belief in the Daishonin's teaching. From the moment the Daishonin proclaimed the establishment of his teaching, he staked his life by waging a struggle of selfless dedication to the propagation of the Law without a moment's rest. These ceaseless efforts eventually led him to arrive at the climatic stage of the Tatsunokuchi Persecution, thereby enabling him to actualise the principle of 'Casting Off the Transient and Revealing the True'. The significance behind Nichiren Daishonin's manifestation of the Gohonzon is 'Casting Off the Transient and Revealing the True'. It was this turning point, in the course of his life, that led to his decision to inscribe the Gohonzon. In Tatsunokuchi persecution, the Daishonin manifested, in his own life as a human being, the life of the Buddha of time without beginning. In other words, he revealed himself as the Buddha of limitless joy while remaining an ordinary person. The life of the Daishonin was a great example of what it takes for an ordinary person to live in oneness with the Great Law. To set out the great path of salvation for the ordinary people in the Latter Day, the Daishonin established the way for them to manifest the world of Buddhahood that he himself had attained. He inscribed his inner life state of the Buddha of limitless joy, the Buddha who has been enlightened since time without beginning, in the object of devotion known as the Gohonzon. He teaches us that the same state of life embodied in the Gohonzon also exists within our lives. The Daishonin revealed the Gohonzon to teach people of this limitless life force. With the Gohonzon as the clear mirror, we should develop confidence in the existence of this power of life in ourselves, in our friends, and in all people. To believe in the Gohonzon is to believe that all people are endowed with the 'life of the Buddha of limitless joy' as a real potential. This is the paean of a champion of humanity. It declares: "I am a human being. You, too, are human beings! How great human beings are!" This is the heart of the Lotus Sutra. Nichiren Daishonin did not establish the Dai-Gohonzon until believers who would uphold this teaching with the spirit of “not begrudging their lives” appeared among the ranks of the ordinary people. The Atsuhara Persecution was called forth by the young people's effort to combat evil. It was the young Nikko Shonin’s bold and indefatigable effort in refuting the erroneous and revealing the true that won him the support of many people in the Suruga area. As a result, numerous people were converted to the Daishonin's Buddhism. In response to the success of the propagation efforts in Suruga area initiated by Nikko Shonin, obstacles and devilish functions emerged in full force. In 1276, Gyochi, the deputy chief priest of Ryusen-ji temple, orchestrated numerous attacks on the Daishonin's followers which led up to the summit of Atsuhara Persecution. Gyochi and his cohorts incited the lay priest Yatoji, the elder brother of the 3 Martyrs, Jinshiro, Yagoro and Yarokuro, to submit a complaint to the authority, falsely claiming the Daishonin's followers as the culprits behind the violence and lawlessness committed on Ryusen-ji temple grounds. As a result, 20 farmers from the Atsuhara village were arrested based on the allegations inclusive of charges of murder, assault and armed theft of rice in 1279. Since those claims that were brought upon the 20 farmers were criminal charges, it was under the jurisdiction of Hei no Saemon. Riding on Hei no Saemon's support, Gyochi was confident to win even in the most reckless and preposterous lawsuit. However, none of the farmers' commitment to faith was wavered by the arrest and this had greatly alarmed Hei no Saemon. Hence, the interrogation he conducted on the 20 farmers was highly unusual. On 15 October 1279, Hei no Saemon tasked his second son to coerce the 20 farmers to chant the Nembutsu but none of Atsuhara farmers yielded. They were later subjected to various kind of torture including firing blunt-tipped whistling arrows at them. Hei no Saemon may not have initially intended to carry out any executions. But the sight of these humble people who so adamantly defied him - one of the most powerful people in the land - and who seemed willingly to lay down their lives for their beliefs must have filled him with irrepressible rage. Since Hei no Saemon's arrogance was greatly challenged by the Atsuhara farmers' undaunted spirit, he rashly proceeded to behead the 3 Martyrs, Jinshiro, Yagoro and Yarokuro on 15 October 1279. 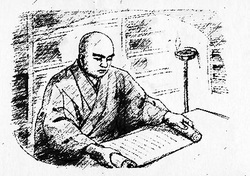 Realising that the believers who would uphold this teaching with the spirit of 'not begrudging their lives' appeared among the ordinary people, Nichiren Daishonin fulfilled the purpose of his appearance in this world by inscribing the Dai-Gohonzon on 12 October 1279, three days prior to the Atsuhara Persecution. The Atsuhara Persecution signalled a victory of the human spirit in which these ordinary followers of the Daishonin, through their magnificent solidarity as Bodhisattva of the Earth, triumphed over the devilish forces of the authority.